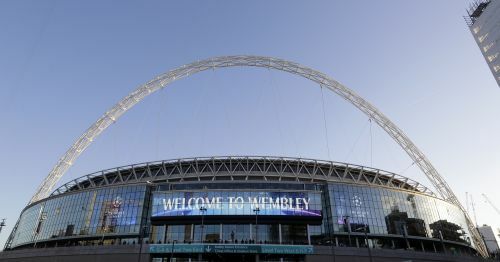 LONDON (AP) — Sports investor Shad Khan's attempts to buy Wembley Stadium could face another obstacle after the English Football Association announced Tuesday it was looking into unspecified allegations of wrongdoing made by a former employee of the American. Craig Kline, who was fired by Premier League club Fulham from his role of assistant director of football operations last year, met with FA officials on Monday after claiming to be a whistleblower with information. Khan, who owns London-based Fulham and the Jacksonville Jaguars NFL franchise, had hoped for a speedy process after launching his 600 million pound ($785 million) offer for Wembley in April. But the FA leadership has faced resistance from within its board, council and people it surveyed across the game about the merits of selling English soccer's national stadium to an outside investor, stalling the process. "We have recently been contacted by Craig Kline who has made a series of allegations about Fulham FC," the FA said in a statement. "We are currently in the process of reviewing these allegations." Khan is confident that the FA will find no wrongdoing. "This is nothing more than the same ongoing nonsense and bogus claims made by a former employee who left the club in 2017," Khan's spokesman, Jim Woodcock, told The Associated Press. "Nothing here merits a further response." The FA Council will discuss the takeover terms on Thursday, although a decision by the body on whether to proceed with the takeover is not expected until after another meeting in two weeks. An FA presentation shown on Tuesday to its Council members and officials from regional branches does feature criticism of the sale, according to a copy reviewed by the AP. "It's like selling Buckingham Palace to Donald Trump," an unnamed grassroots player is quoted as saying on the FA slide. Another questioned if the FA could be trusted with spending the proceeds of the sale. The FA has pledged to place the funds in a trust to improve footballing facilities across the country. The FA said two out of three grass pitches are inadequate away from the professional game. The FA leadership initiated a public consultation of 22,500 people, including club and league officials, referees, adult and youth players, coaches, volunteers and members of the general public to push their case for the sale. But the results were mixed. Some 45 percent of the grassroots players surveyed by the FA were unsupportive of the sale, with only 38 percent in favor. Only in one of the nine groups of people questioned by the FA — youth players — was there more support than opposition. The majority of fans and members of the general public believe the windfall would not benefit their area, according to the presentation. Under the terms of any sale it would have to always be called "Wembley Stadium" and the FA would have to approve of a potential future NFL franchise in London being based there. But the FA will allow the NFL to have priority use of the stadium from September to December as long as it is available for key soccer games the rest of the year. The FA forecasts that the sale would save 72 million pounds over the next six years only on the improvements that are needed for improvements at the stadium, which opened in 2007 after the previous incarnation on the site in north London was demolished.